Can Red Mite Infest Your Home? Home » Blog » Will Red Mite Infest Your House? Will Red Mite Infest Your House? Over the last five or six years, I have been dealing with the dreaded Red Mite in my poultry houses and trying different red mite treatments to get rid of them. Since posting “How to get rid of a serious red mite infestation” (when I found a large number of mites in one of my hen houses: Summer 2009), the comments to my post have been flooding in. 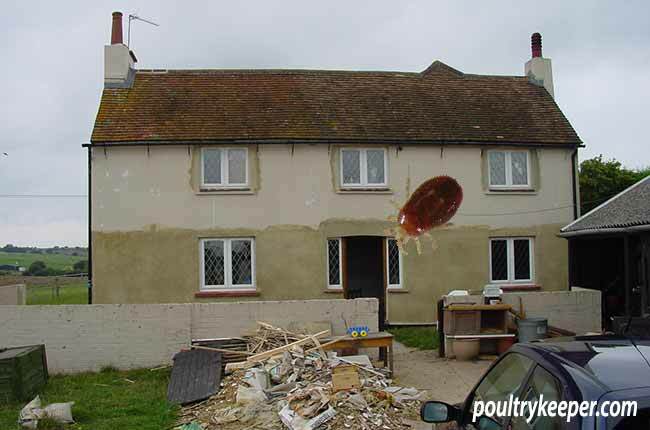 It’s a popular post and hopefully it has helped people to remove the dreaded Red Mite from their chicken house but what about red mites in houses and red mites on humans? Do red mites bite humans? Leaving Home because of Red Mite? From the comments that were made, a few people were saying their own house (that’s house, not poultry house) had been infested with Red Mite and many people were asking whether Red Mite can bite / feed from us. Now if you are not familiar with red mites or what they look like and where they are -normally- found, I would suggest you first read my ‘Ultimate Guide to Red Mite‘ first and then come back and read on. So there does appear to be a problem here. Laura seemed to think that this was a different type of red mite that would bite humans so I decided to go to the experts at the University of Newcastle to find out more. Ideas for treating your house for red mite. There are numerous products out there that will treat poultry houses and I break these down into different categories in the ultimate guide I wrote. but what can you use safely in your house? Well, in commercial poultry houses, red mite are treated with pesticides, although there is growing concern that some mites are becoming resistant and different types of pesticide are used to try to prevent this from happening. There are pesticide based products that are designed to be used in the home to remove common fleas that can infest the carpets and other areas of the home. These traditionally would have only been available from a vet but now are available online. You spray it around the carpet / edges and under skirting boards in cracks and then vacate the room, leaving the door closed for a couple of hours. Follow the manufacturers instructions and certainly don’t breathe the spray – ideally wear a mask. One I have used is Ardap Spray and another similar product is Indorex spray (called ‘Knock Down’ in America). There are pest control companies that will deal with fleas in a home. They will have access to knapsacks of pesticides that they can use so if things get too bad, it might be worth calling them in. I would still repeat the spray application every 3 to 4 days. The life cycle of a mite is as little as 7 days – so treating before they have a chance to lay eggs will reduce numbers faster. Chilling the mites, as suggested by Laura, leaving her heating off over the winter may stop them reproducing and feeding but they can survive in a poultry house outdoors over the winter and it takes extreme temperatures to actually kill them. Newcastle University are testing different essential oils since these contain chemicals toxic to pests. For example, linalool from lavender is toxic to red mites. Their latest research shows that red mite mortality rates decrease with time – so the oils need to be fresh to work. My granddad used to hang fresh Lavender bunches in his pigeon loft and I thought it was to keep the loft smelling fresh! The female red mite lays her eggs after a feed. There is also evidence though from Newcastle University that the acaricidal effect (killing power) of essential oils increases as mites are starved for longer periods of time so could covering yourself in an insect repellent preventing them feeding for a few days whilst treating your house may help to knock down more mites? Diatom is safe and can be used in the house – dust cracks and crevices – the good news is it will hoover up without leaving a mess afterwards. I look forward to finding out more about this and will share it with you when I do but it may help you to get less bites. I hope this gives you some ideas of things to try around the home, if I come across any more information, I will share it with you here. Have you had Red Mite living in your house or biting you? Please leave a comment to help others who read this.